Eczema on Face: How to Treat Eczema Inflammation? Having eczema is no fun, to say the least, but getting eczema on the face is a little worse, as the face is the first part of the body that other people see and impressions are often made based on that. Whether mild or severe, eczema can make a sufferer want to hide away at home because of the red, scaly patches that mar the skin, and when a flare-up happens it can look worse because of raised bumps—and if scratched, those bumps can become open wounds. Eczema prompts a vicious cycle of healing and reappearing, but there are ways to manage it and calm it down, both natural and pharmaceutical (typically through topical creams such as cortisone). According to the National Eczema Association , 31.6 million people in the U.S. suffer from eczema, with at least 17.8 million dealing with moderate to severe eczema. Childhood eczema affects 10.7% of the population. For many decades, the medical community has been tackling the issue of whether eczema is an immune system abnormality or has more to do with a defect in the skin barrier. Recent research has led doctors to understand that it’s more likely related to the immune system, and with this understanding more reliable targeted treatments should likely become available to sufferers. With eczema on the face, pictures can become a nightmare and being in them is the last thing you might want to do. But with the right treatment and knowledge of your triggers, taking photos with eczema on the face can soon become an activity no longer feared, but enjoyed. Eczema is a skin condition (2) that causes scaly, itchy skin that develops a rash (which can get worse and often appears only when the skin is scratched). This rash can turn into small, white blisters that will open and scab up if scratched. Cracks in the skin and deep fissures can occur, and if deep enough they may bleed. When healing, the skin can be so dry that it becomes flaky. It’s also unknown why eczema shows up at certain points in a person’s life and then disappears. For some, it’s an issue in childhood and then it fades once they reach adulthood. Conversely, for some there may have been no skin issues in childhood but then in, say, their mid-twenties they suddenly start to develop eczema. Eczema can show up on any part of the body, but the most common spots are the hands, feet, legs, arms, and face. What Triggers Eczema on your face and body? Since we don’t yet know what causes eczema, it’s important to learn what the triggers are for you (3). There are quite a few out there, but if you pay attention you will, over time, discover what potentially causes your flare-ups and then you can work towards avoiding them. With eczema on the face, it might be as simple as the facial cleansing products you use. To investigate these effects, simply refrain from using the products in your current facial repertoire—that means all toners, cleansers, creams, scrubs, shaving creams, and masks. Keep it simple for the next month. Buy products that are natural and organic, and made with as few ingredients as possible. Shave with coconut oil. Avoid harsh chemicals and ingredients such as retinols because they can exacerbate flare-ups. Products with aloe vera, rose water, rosehip seed oil, and chamomile are soothing to the skin and will in fact help calm the inflammation prompted by eczema. Rosehip seed oil is one of the better remedies for eczema on the face, as it will restore some much-needed hydration back to the skin. After the month is up, see if the eczema has gone away or at least reduced. If so, then you know that something you’ve been using is likely triggering the flare-ups, so using a product one at a time and see what happens. If your skin flares up again, then you’ll know specifically what the trigger is and can stop using it. Animals are another potential trigger, but you’ll arrive at this through a process of elimination; it will take time, but it’s worth it. Food can also be a huge trigger for many people. Common culprits are soy, wheat, dairy, eggs, corn, nuts, and seeds. You will need to start an elimination diet to determine which ones are causing your eczema. Expect this process to take up to three months. When you have eczema on the face, natural treatments are a better first line of defense because these products will not aggravate or strip the skin. The last thing you want to do is put cortisone on your face because cortisone, over time, thins the skin. It may stop the itching temporarily, but you will need to keep applying it, and over many years of use your skin cells will become weakened—not a good option for your face. Aloe vera is soothing and cooling to the skin when applied. 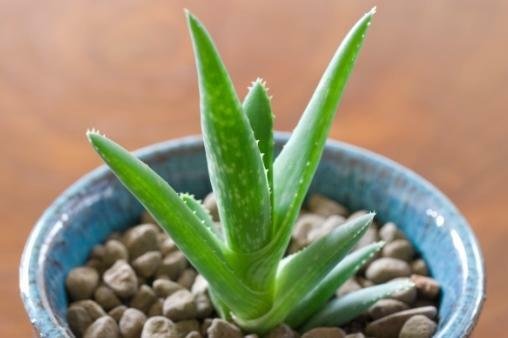 Aloe vera is a cactus-like plant with thick, spiky “leaves” filled with a gel-like substance. It’s this chunky yet liquid substance (almost slimy) that is used as a healing agent for skin conditions, including burns, rashes, sunburn, and eczema. It’s soothing and cooling to the skin when applied, and has been used for centuries as a first-aid treatment. You can buy a plant and keep it on a windowsill in your home, cutting off pieces as needed. It doesn’t keep very well once cut (turning blood red when it hits oxygen in the atmosphere) so don’t think you can cut a huge leaf off and save it; it won’t be in an ideal condition the next day. Alternatively, you can purchase bottles of already extracted aloe vera gel in any health food store. Look for 100% gel that has no fillers or color added to it, and store it in the fridge for an added soothing benefit. Aloe vera is packed with over 75 vitamins and nutrients that all contribute and promote the development of healthy skin cells, plus essential fatty acids that hydrate itchy, dry skin. Manuka honey is a newcomer to the eczema natural treatment lineup, but it’s fast becoming a strong contender because of its healing properties. 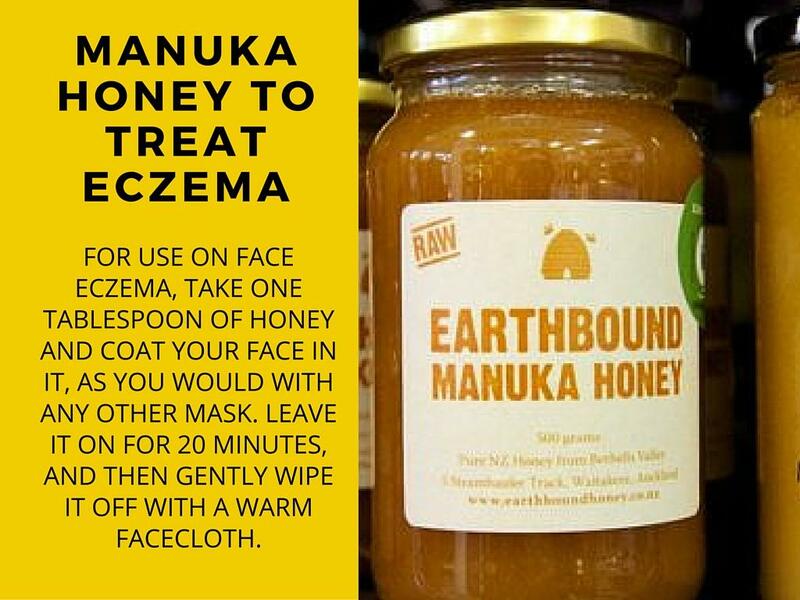 Packed with amino acids, organic acids, vitamins, and flavonoids, as well as having antibacterial properties, Manuka honey is an indispensable component to treating and managing eczema. Look for raw, unpasteurized honey. For use on face eczema, take one tablespoon of honey and coat your face in it, as you would with any other mask. Leave it on for 20 minutes, and then gently wipe it off with a warm facecloth. For added benefits and healing, combine two tablespoons of plain Greek yogurt (the fattier the better) to the tablespoon of honey until a rich paste is formed, then follow with the steps above. The yogurt adds much-needed moisture back into the skin and the lactic acid in it sloughs off dead skin cells. Coconut oil is an ideal moisturizer. 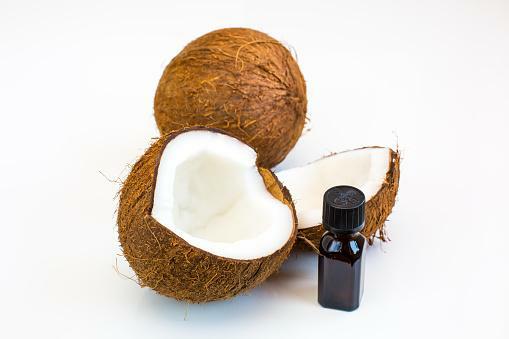 Coconut oil has been used for centuries as an emollient for dry skin, and can be found as an ingredient in many commercially produced cosmetic products. It’s an ideal moisturizer when dealing with eczema, because it isn’t harsh, is primarily made up of fats, and its antifungal and antibacterial properties help fight off any potential infections from scratched skin or open wounds. 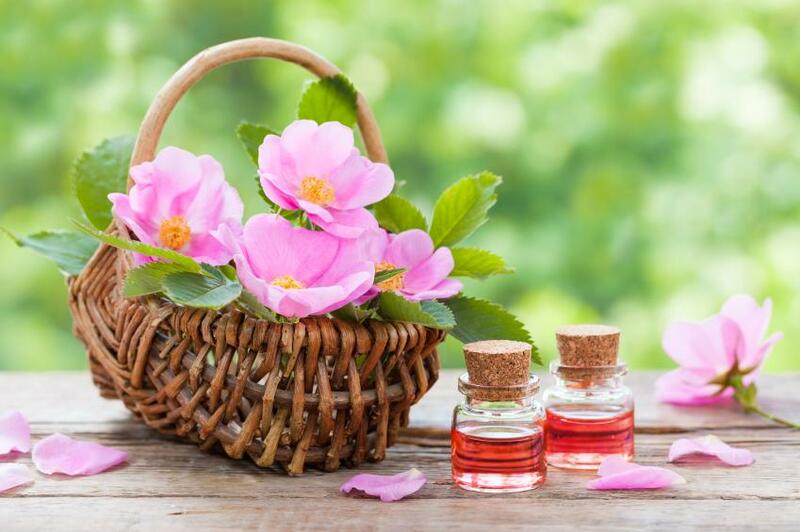 Rosehip oil contains 77% fatty acids, an essential component in repairing cells that can be damaged by scratching eczematous skin. Rosehip seed oil (or just rosehip oil) is loaded with vitamins A, C, and E, plus antioxidants that are all good for the skin. These elements are known to hydrate and soothe dry, itchy skin and reduce the appearance of scars. It also has retinoic acid, which can help cells turn over in a healthier way. Rosehip oil also contains 77% fatty acids, an essential component in repairing cells that can be damaged by scratching eczematous skin. Apply to freshly washed skin twice a day. Two pumps of oil will go a long way. Rub in circular motions to help it penetrate into the skin. Look for cold-pressed, organic oil with no fillers, except for vitamin E because this vitamin prevents rosehip oil from going rancid. You can store it in the fridge for later use—the cool temperature will also help calm the itching. If you want to benefit from all four products simultaneously to treat eczema on the face, create a mask with each ingredient in it, using yogurt as your base. Take half a cup fatty yogurt and add one tablespoon of Manuka honey, one tablespoon of aloe vera gel, one pump of rosehip seed oil, and one teaspoon of coconut oil (though add this one first so it can warm up and liquefy). Combine to make a paste. Apply to a clean face and allow to sit for 20 minutes, and then wash it off with a warm facecloth. The rest can be stored in a container for later use. This mask can be used nightly if your eczema is bothering you.